I’m working like a busy bee through all of the great Mass places I’ve been (and way too many photos I took!) but I wanted to give a quick mention to the nice folks at A Festival Of Postcards, for including Retro Roadmap in their latest edition. There I am alongside “contributors from over 30 bloggers on 3 continents (Asia, Europe & North America)” – cool! 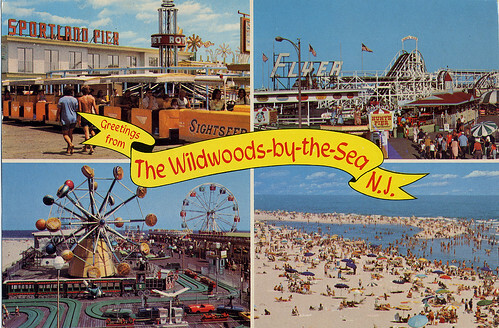 Editor Evelyn Yvonne Theriault saw my postcard of Wildwood NJ (below) and liked it- little did she know I am also a collector of postcards (chromes & linens, diners, amusements, downtowns, you know me…) so this was an extra thrill to be included in the Festival! It has also inspired me to want to scan in my collection, as right now I’ve barely got any online. Anyone have any more hours in the day ;-)? If you like vintage post cards, or just want to see what all the fuss is about, there are a lot of great links on this Festival- check it out!